The green is a fresh, bright parsley sauce. As a starting point for this stunning dish, executive chef Kyung Up Lim and the Michael’s New York team created the most delightful parsley sauce, full of the bright, fresh flavor you expect from that herb. Then, the rest just naturally evolved. 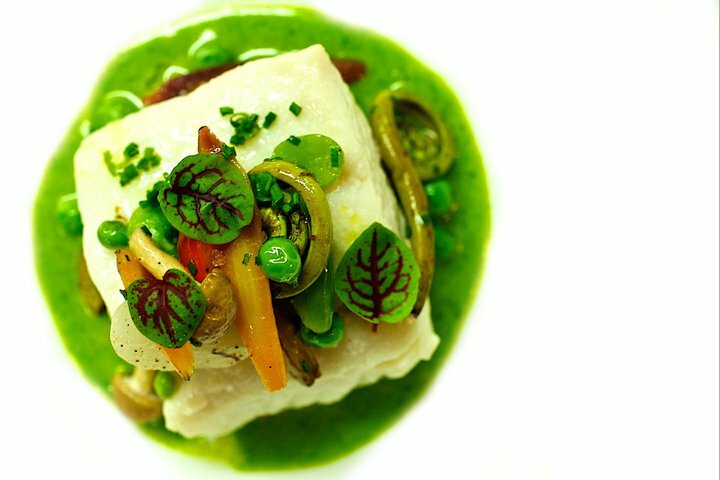 Olive oil-poached Atlantic halibut has the most tender meat and the lightest flavor, perfectly highlighted by the stunning emerald-green parsley sauce it rests upon. An early summer succotash of the freshest farmers’ market veggies rounds out this light and satisfying offering.